How and when did Lean leadership become separate from Lean production and become its own distinct area of study and focused practice? Well, in the mid-1980s through mid-1990s, all anyone really knew or cared about was “JIT” and “Lean production,” the term introduced by John Krafcik in 1988. People’s focus was entirely on Lean in operations and on Lean tools and methods. The unique mindset and leadership capabilities necessary to lead Lean production (and later, Lean enterprise) efforts did not exist in any explicit form. Lean leadership was not well understood by even those who had pioneered its application in companies outside of Toyota. In July of 1994, I transferred from Pratt & Whitney’s engineering department in Florida to their Connecticut manufacturing operations. I participated in my first Shingijutsu kaizen a month later, followed by several more in the year thereafter. I had spent the prior three years reading lots of books and papers on leadership theory and practice and Eastern philosophy. I did this as a personal interest and self-study activity to improve my own leadership skills at work. As a result of what I had learned, I was able to make connections between what I had read, how I led people in practice, and what I learned in Shingijutsu genba kaizen. Click on image to view presentation. I soon figured out how the Lean tools and methods taught to me by Shingijutsu sensei could be applied to improve one’s leadership skills and capabilities – especially my own. I called it “continuous personal improvement.” Nobody was thinking of Lean leadership in that way then. The only thought was how to apply Lean tools in production to reduce costs, improve quality, and shorten lead-times. In October of 1995, I attended a focus group meeting on leadership development and shared my ideas on “continuous personal improvement” with the group. Everyone, especially the leader of the focus group (an outside leadership development consultant) was impressed with what I had come up with. I formalized it into a short presentation and gave copies to the executive vice president of operations and his director of operations in charge of leadership development. They loved what I had created and asked me to present it at the upcoming operations leadership meeting on 17 November 1995. Near the end of the day’s program, I gave my presentation to the 150 or so people in the audience (click on the image to view my presentation). Though it was well-received, I could sense that people found it to be a strange and unusual way to think about leadership and how to improve one’s leadership capabilities. It was different that the Western view of leadership that my peers were familiar with. This was the beginning of my two-decade effort to understand and develop the concept and practice of Lean leadership. So, you could say that the start of Lean leadership as its own distinct area of study and focused practice started here in 1995. A few years later, I formalized the thoughts on the presentation and wrote my first paper on Lean leadership titled “Continuous Personal Improvement,” and was published in 1998. 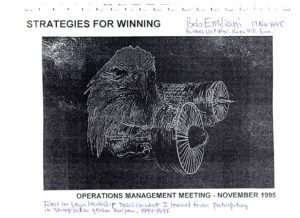 Remember, at the time, we had precious little documentation from Toyota to help us understand how they understood and practiced leadership and leadership development for their production system. But, there were some books translated into English that once could easily deduce clues from — such as “Respect for People” (a constant theme) — and I found that my ideas on Lean leadership were closely aligned with theirs. Importantly, it was the Shingijutsu training on genba kaizen and the conversations at dinner with sensei that filled in many blanks about the thinking behind TPS and the ways in which Toyota managers led people. Shingijutsu genba kaizen was instrumental in helping me understand Toyota-style leadership and propelled me to become an early advocate for the “Respect for People” principle. My second paper, “Lean Behaviors” (1998), was squarely focused on “Respect for People” as the enabler for Lean production success. This, of course, led to more research on Lean leadership and the publication of many books and papers. 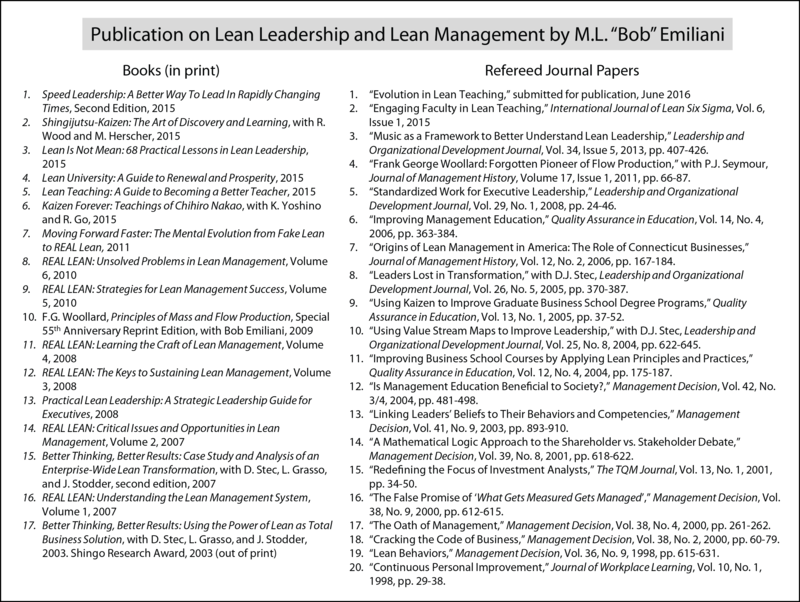 Click here to view a complete list my publications on Lean leadership. Sadly, it was not until 2008 that people started to take an interest in Lean leadership. That interest gained traction in 2010 and has grown stronger in the last few years. As the “father of Lean leadership” and as a 20-plus year advocate of the “Respect for People” principle, I cannot help but lament how long it has taken people to realize that these are fundamental to Lean success. We cannot change the past, but we should constantly reflect on those people — good and capable employees — who have experienced harm (e.g. layoffs) by leaders’ improper understanding and practice of Lean management. The Lean community must strive to do far better in the future. Thank you Mr. Emiliani for again sharing your wisdom and experiences. One note of interest to me is the fact that my experience parallels yours in many ways. I and I’m sure many others also experienced the transition and progression of Lean into their work about the same time you did. Today I see lean as a dynamic tool that consists of many thing, philosophies and beliefs that become a journey of progress into relative Leanness…I lived the experiences and Lean transitions that you and Mr. Krafcik write about and always want to add my 2 cents to the conversation…IMHO.